Climbing is a hazardous activity that can lead to injury and any use of the Clip ‘n Climb Chelsea arena not in accordance with the supervisors’ / clippers’ instructions may also be hazardous and lead to injury. Clip 'n Climb Chelsea have taken every possible step to ensure that you have a completely safe and fun experience through the use of appropriate equipment and the employment of an experienced team. Clip ‘n Climb Chelsea and its staff (also herein referred to as “we”) will endeavour to provide a service to you with reasonable care and skill. Your safety and enjoyment are our prime concern; we want to ensure that you achieve your objectives and have as much fun as possible in a safe environment. In the absence of negligence or fraudulent misrepresentation by Clip ‘n Climb Chelsea or its staff, neither Clip ‘n Climb Chelsea nor its employees or agents shall accept any responsibility for the death, personal injury or illness sustained by any customer or guest while on Clip ‘n Climb Chelsea premises due to negligence on the part of participants. All participants are required to sign a disclaimer agreeing to Clip ‘n Climb Chelsea’s Terms & Conditions BEFORE they can begin climbing in the arena, the purpose of which is to ensure that the risks inherent in the sport of climbing are acknowledged (the signature of a parent or guardian is required for any participants under the age of 16). Customers booking online are required to acknowledge and agree to the Terms & Conditions as part of the booking process. Customers making a booking by telephone will be sent a confirmation email containing the Terms & Conditions; in placing the telephone booking customers are accepting these terms and conditions. Any other customers will need to complete and sign a disclaimer form when they arrive at Reception. All sporting activities demand a degree of agility, strength and stamina. It is not the responsibility of Clip ‘n Climb Chelsea to know whether or not a customer is medically fit and able to climb. It is the responsibility of the customer to confirm that he / she is so fit and able. We must be made aware of any past injuries that may affect your participation. Any customers choosing to take part when pregnant (which we advise against) must inform us of their pregnancy and proceed at their own risk. If you are in any doubt about your ability to participate, we advise you to speak to a member of Clip ‘n Climb Chelsea staff. By signing up to an activity you acknowledge the conditions and participation agreements; that you are in a fit state of health to participate and do not have a medical condition that may be triggered or aggravated by participating in activities in the climbing arena. Bookings must be made by those aged 18+. In making any booking with Clip ‘n Climb Chelsea you are accepting all of Clip ‘n Climb Chelsea’s terms and conditions. When you purchase a Clip ‘n Climb product or a voucher from Clip ‘n Climb Chelsea / external provider, you become legally bound by these terms and conditions. Please do not purchase a Clip ‘n Climb product or complete a booking until you have read and understood these terms and conditions. All prices include a safety briefing, supply of climbing equipment and supervision in the arena. General entry tickets give customers access to 20 wall challenges. Tickets are sold separately for the three special attractions - Leap Of Faith, Vertical Drop Slide and Stairway To Heaven – unless you have an exclusive hire booking where the price is inclusive of the special attractions. Please note there is a minimum height requirement of 130cm for the Leap Of Faith and Stairway To Heaven attractions. Special attraction tickets are non-refundable and we are not able to replace lost tickets. 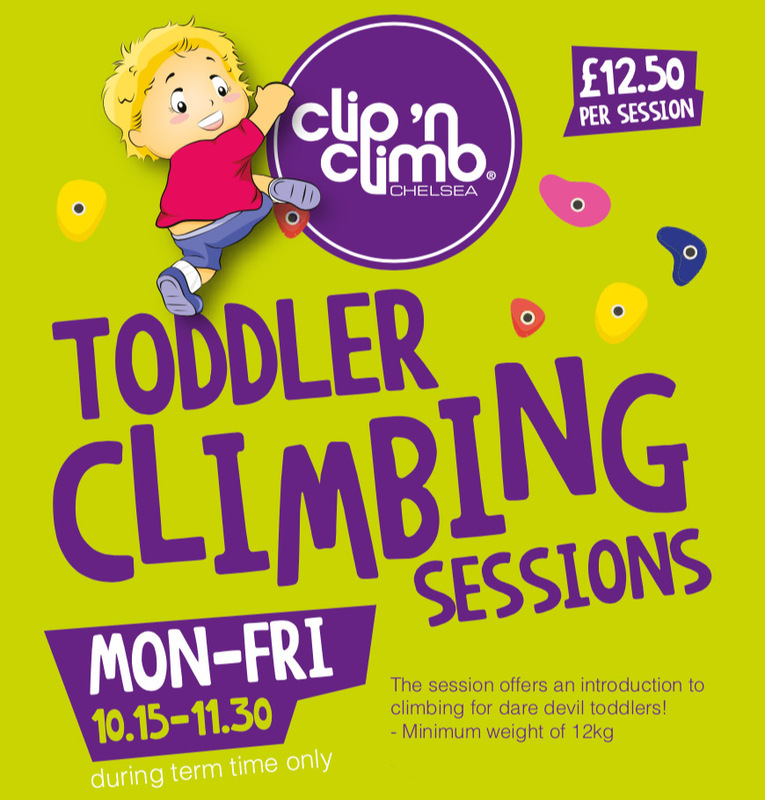 A minimum age of 4+ applies at Clip ‘n Climb Chelsea. An adult MUST check in with any climber under 18 years old and remain onsite throughout the session. If one parent or guardian accompanies multiple climbers under 18 (some of which may not be their own children) that adult is responsible for the group of climbers. We cannot allow non-climbers into the arena except by prior agreement. Parents / guardians can watch from the balcony upstairs or wait in The Gallery Café. Any purchase of a slot that is not immediately scheduled to a specific session will be issued by Clip ‘n Climb Chelsea in the form of a voucher, which will show a unique reference and a clearly stated expiry date. All vouchers must be used prior to that date or they will be forfeited. Clip ‘n Climb Chelsea accepts no responsibility for any lost or stolen vouchers; any lost or stolen voucher will not be replaced. Failure to produce a valid voucher on the day of your session means that full payment will be required to cover the cost of the session before you will be allowed to proceed with registration. This payment may be refunded on receipt of a valid voucher within 28 days of your session date. Our cancellation policy for standard session bookings allows customers to cancel (or amend) their booking providing this is done up to 48 hours before their session start time. If you need to cancel your booking, Clip ‘n Climb Chelsea will either refund your original payment or issue a voucher - to the same value and conditions as applied to the original booking - for future redemption. If you need to cancel or re-book your session please call the reception team on 020 7736 2271 while the phone lines are open (please check our website for times). For children’s parties and school bookings, our cancellation policy allows customers to cancel (or amend) their booking providing this is done up to 7 days before their booking start time. After this time, no refunds / transfers will be permitted. For all other types of bookings or venue hire, separate cancellation terms apply and this information will be provided during the enquiry stage and re-confirmed at time of booking. Clip ‘n Climb Chelsea reserves the right to cancel or change a customer's booking at any time if there are an insufficient number of slots booked for the relevant session or if scheduled maintenance or training is required. Clip ‘n Climb Chelsea will never implement this condition without giving the customer at least 24 hours notice. In the event of a cancellation of your booking (as opposed to a re-scheduling of it) Clip ‘n Climb Chelsea will refund the full value of the booking to you but will not accept any additional costs incurred. If for any reason Clip ‘n Climb Chelsea is unable to provide the service promised for reasons beyond its reasonable control, we will endeavour to re-arrange your session. We will not, however, accept responsibility for any additional costs that may arise as a result of the situation being beyond our reasonable control. Customers are required to check in with Clip ‘n Climb Chelsea’s reception staff prior to their session start time; this is to allow time to complete the check-in process and ensure that the group safety briefing can run to schedule with ALL session participants present. We cannot allow non-climbers into the arena except by prior agreement. Parents/guardians can watch from the balcony upstairs or wait in The Gallery Café. Loose items and/or coins MUST be removed from pockets before climbing. We have personal lockers available for customers to securely store belongings during their session (you will need a £1 coin per locker). When climbing in the arena all participants must comply with instructions given by the Clip ‘n Climb Chelsea staff and any centre signage. In additional to the standard climbing equipment provided, extra items MUST be used in accordance with staff instructions for the special attractions. Please ensure special attraction tickets are used no later than 40 minutes after your session has started to avoid disappointment. Misbehaviour in the arena will not be tolerated and we reserve the right to refuse use of any of the attractions if we feel customers will be a danger to themselves or others. We allow a mix of adult and junior climbers in the arena at the same time during standard sessions. Clip ‘n Climb Chelsea offers some adult only evening climbing sessions. The arena can be exclusively hired for groups of adults or groups of juniors. Clip ‘n Climb Chelsea reserves the right to change its climbing arena policies from time to time. Clip ‘n Climb Chelsea will not accept antisocial behaviour in the climbing arena or anywhere within the centre. If any customer / guest is abusive to any other customer / guest or a member of our staff, Clip ‘n Climb Chelsea reserves the right to remove the offending person from our premises without any refund. There is a zero tolerance approach to banned substances. Consumption of alcohol is prohibited unless this has been agreed as part of a private party / corporate event booking, where alcohol is only to be consumed by customers AFTER they have finished climbing in the arena. Those bringing unauthorised alcohol into the centre will be asked to leave. Customers are not permitted to take part in climbing activities under the influence of alcohol; Clip ‘n Climb Chelsea staff reserve the right to refuse access to the arena if they suspect you may be under the influence of alcohol or any banned substance. Customers / guests are not permitted to consume food or drink onsite unless it has been purchased from The Gallery Café. The exception to this is where the party room has been booked for a children’s birthday party, or outside catering has been agreed as part of a private party / corporate event booking. Neither Clip ‘n Climb Chelsea nor its employees or agents will accept any responsibility for loss, theft or damage to valuables or any personal possessions that belong to any customer or guest during their visit to the centre. For lost property enquiries please contact [email protected]. If your item is found, it will be held for a maximum period of one month after which time the item will be donated to charity if it remains unclaimed. Clip ‘n Climb Chelsea accepts no responsibility for returning items to you, or for any items of lost property that remain unclaimed within this timeframe. Clip ‘n Climb Chelsea sends out information to its customers via email from time to time about the centre, special offers and events. A box on the disclaimer form allows you to indicate if you would rather not receive this information from us. As part of our marketing and development programme, we occasionally take photographs and video footage of our climbers for use on our social media feeds and promotional material. If you would NOT like your child photographed, please advise us before the start of their session. The scheduling of a slot into a climbing session or private hire, school bookings, parties and corporate events. A Clip ‘n Climb Chelsea session is the overall period of your booking, normally 90 minutes, excluding the time before and after your session has run its course. The length of time within any one session that a customer will be in the climbing arena. Note: during a customer's climb time, he / she may not be climbing for the entirety of that time. For example, they may be waiting to use a particular wall challenge or being fitted with additional equipment to use the special attractions. During a Clip ‘n Climb Chelsea session, there will be a number of customers. Each utilises or occupies a slot within that session. A document, whether in hardcopy form or electronic, which entitles its owner or holder to a slot within a Clip ‘n Climb Chelsea session.